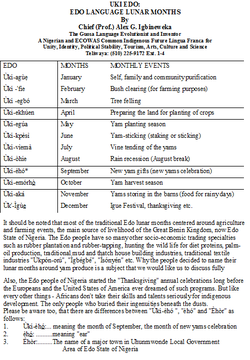 Also, the Edo people of Nigeria started the "Thanksgiving" annual celebrations long before the Europeans and the United States of America ever dreamed of such programs. But like every other things - Africans don't take their skills and talents seriously for indigenous development. They are the only people who buried their ingenuities beneath the dusts. By Chief (Prof.) Alex G. Igbineweka.